Had Abraham Lincoln spoke of a nation “of the geeks, by the geeks, and for the geeks,” he would have been perfectly describing the Penny Arcade Expo, known to geeks near and far simply as “PAX.” The three day convention in Seattle, Washington is a celebration of everything that it means to be a geek, especially one of the gaming variety. You’ll find video games, tabletop games, miniature games, handheld games, games made of games , and even the game of life (no, not Spore ). I crossed the entire nation just to visit PAX, leaving the safety of my volcanic lair to trust my life and, more importantly, my luggage in the hands of commercial air travel so that I could commune with fellow gaming enthusiasts in this annual pow-wow. And, perhaps, find some nifty gadgetry along the way. Here are a few of the highlights. If you’ve been submersed into an iron prison deep beneath the ocean waves, you will probably still have heard about Guitar Hero and its sequels. You may even have heard whispers of a followup game which would bring to bear the power of a fully armed and operational music simulator. 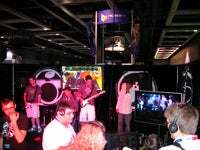 Rock Band is real, and it’s heading to PS3 and Xbox 360 this year. You’ll be able to jam to an extensive catalog of classic and contemporary rock tunes with guitar, bass, drums, and vocals, either in person or online and, let me tell you, it’s sweeter than a bowl of Chocolate Frosted Sugar Bombs in strawberry milk. While I didn’t have a chance to round up my own posse for some rock and rollin’ action, I did watch plenty of other attendees fulfill their dreams of playing onstage, completely with adoring groupies (not included in the final retail version). The price for Rock Band hasn’t been officially announced, but according to Amazon, a full set with all the peripherals will run $199 (they also list guitars and drums for $80 each, the game going for $60, and the mic costing $30). That’s pretty steep, to be sure, but when you’re a famous virtual rock star, you’ll look back on it and laugh heartily while you lounge on your beanbag chair filled with money. Before my purchase of an Xbox 360 this past April, my one and only full blown console had been an original Nintendo Entertainment System acquired when I was but a wee lad. It still holds an honored place on my entertainment center, along with controllers, Zapper, and a handful of games. But it’s not always the most reliable piece of equipment. Shame you can’t just go buy a new one, huh? Well, you can’t buy a new one from Nintendo anyway. But Messiah Entertainment has rolled out the Generation NEX, a tribute to the original Nintendo that brings a handful of improvements and contemporary technology. 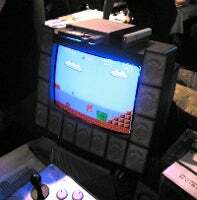 Dual-mono sound, an extra cartridge slot for Famicon games (the Japanese equivalent of NES), and add-on wireless game controllers are just a few of the things that would have made the 8 year-old version of myself gape in amazement. The $60 NEX comes with one wired controller, an AC adapter, and A/V cables. For $50, you can buy a two-pack of wireless controllers that let you rock Super Mario Bros. 3 from 30 feet away and for $60 you can pick up an arcade-style controller with joystick, turbo dials, and slow motion (for lamerz ). Best of all, any original NES controllers or peripherals you already have should work with the NEX too. If they could throw a childlike sense of wonder and innocence in the box, then we’d have the whole kit-and-caboodle. You migth say that I’m only into miniature gaming a little . When I was back in high school I collected lead and pewter miniatures for Dungeons and Dragons, but it’s been years since I’ve had bought any of those, and the rest are collecting dust in my parents’ attic, much to their dismay. Miniature gaming has recently experienced a bit of resurgence with things like WizKids’s Pirates series of constructible strategy games. A mix between miniatures and board gaming, this high seas adventure involves building little pirate ships and engaging in combat with friends. All well and good, and I love pirates as much as the next man—unless, of course, the next man is some sort of pirate aficionado . But if you want to convince me to play a game where I have to build things, you’d better have something compelling . Something like… Star Wars . WizKids’s booth was showing off the Star Wars game using giant miniatures. 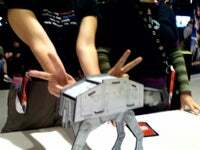 Oxymorons notwithstanding, watching a pair of opponents face off with a foot high AT-AT walker against a Corellian Corvette is a battle I can get into. Packs for the game cost about $5 and contain eight constructible miniatures and six cards. Sadly, the giant versions aren’t available to the public, meaning I cannot stage elaborate battles over the terrain of my living room, a fact which my roommates will be only too glad of. That’s only the barest smattering of my experiences at this year’s PAX. There was plenty more fun and excitement to be had, and I look forward to returning in 2008. Maybe they’ll even invite me back, despite the fact that I tried to sneak the entire Rock Band setup into my suitcase. Hopefully they won’t hold that against me.